Sold by Great Price Media and Fulfilled by Amazon. Gift-wrap available. Sold by Great Price Media and ships from Amazon Fulfillment. Sold by skyvo-direct-usa and ships from Amazon Fulfillment. 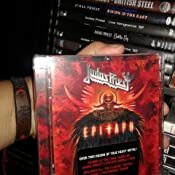 In May 2012, Judas Priest wrapped up their epic "Epitaph" world tour with a storming set at London's Hammersmith Apollo. The band, having announced that this would be their final large-scale world tour, celebrated their last and possibly final show with an incredible career-spanning set list that brought down the house. In addition to performing all their classics "Breaking The Law," "Living After Midnight" and "You ve Got Another Thing Comin'" the Priest dug deep into their catalog, performing at least one song from each of their albums, which rounded off their 23-song set list. Now, one year later, this legendary set will be released on DVD, BluRay and digital long form video by Legacy Recordings (US). 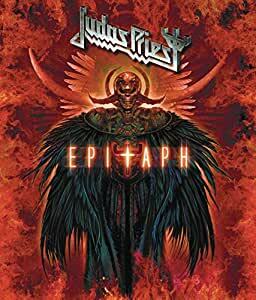 The Epitaph captures Priest's electrifying over the top metal onslaught and is proof they are still at the top of their game after 40 years of headbanging. I saw the Epitaph concert video when it was out for a one day showing in a local movie theater. Having seen Priest on this tour I was aware of the fantastic songs and sound that the band put together on the tour. This concert video is a must for any Priest fan. All the great songs and the band sounds fantastic. Rob's voice is great and the band delivers like very few bands new or old can. My only negative on the video is the over use of changing camera views. The video quality is top notch but too many times the camera keeps switching quickly between close ups of the band members. Not a deal breaker but something I noticed and wished there was less of. Outside of that this is a worthy addition to any Priest fans collection of Metal magic. Long live the Priest. I absolutely love this bluray. Video and audio are outstanding. Performances are outstanding. Can't add much more to what others have said. I do wish they would retire a few of the popular songs from the set list...Breaking the Law, Living After Midnight, etc., ...and throw in some others like The Rage, Delivering the Goods, Raw Deal, Call for the Priest...but that's just me. They did throw in Blood Red Skies which was just awesome! The rest of the set list was great. My only other complaint would be the rapid fire video editing which seems to be prevalent in just about every recent live DVD/Bluray release. 5.0 out of 5 stars"This could be our last show"
I love this DVD...I've already watched about 5-6 times. The sound is great and the setlist is a dream for Priest fans. Especially, the deep tracks like "Starbreaker" "Night Crawler" "The Sentinel" and "Blood Red Skies"
...and what better way to open the show than Rapid Fire and Metal Gods! For some reason, much better this time around than the British Steel tour. Rob Halford's voice is in fine form on this tour as he nails some amazing high notes during Night Crawler, Blood Red Skies, and Victim of Changes. His only weakness is changing outfits between every song. One thing I love about a HALFORD show is he sticks to jeans and t-shirt. KK Downing is greatly missed, but Richie Falkner really delivers the goods. I especially like his intro to "the Sentinel" with Glenn. The editing on the DVD is a bit fast, however the cuts are not just completely random. For example it will go from wide shot of the stage to a medium close up of Glenn to a close up of Glenn's face to an extreme close up of his fingers on the guitar. One major weakness of this DVD is lack of crowd shots. They keep cutting back to this generic master shot of the crowd from the side, but there are very few close ups of any fans. If you were at this show, don't expect to find yourself! It's almost like they didn't have permission to film the crowd or something?! Compare this with the Electric Eye 1986 concert in Dallas where the fans are a major part of the concert. I was lucky enough to attend the Epitaph show in Denver and this London DVD is almost identical. One minor detail that I miss is the cool as heck Epitaph/Legacy banner during Blood Red Skies. At least all the pyro is still being used. Anyway, if you saw Priest on the Epitaph tour this is a great souvenir to pick up and relive the excitement. The massive setlist should please all types of Priest fans. Please note the setlist on the Amazon production information is way out of order. Never fear, the actual DVD has the real setlist in the order it was played during the tour. 5.0 out of 5 starsPriest Captured at Their Best! With over two hours of Priest style Heavy Metal I was thrilled when I heard the first notes to Heading Out to The Highway to the powerful version of Beyond the Realms of Death. Halford and company deliver another stellar concert experience, and even with KK Downing gone from Priest's line up, the addition of Ritchie Falkner as his replacement I feel was well received and I felt to some degree that Ritchie actually seemed to breath some new life to the band. His interaction with Glenn Tipton throughout the concert seem really fresh and very energetic, and made the experience for me all the better. Of course the members of Priest have grown older, and even the Metal God has succumbed to the ravages of time. Some songs where I wish I would have heard the legendary high notes that made him the singer that other metal gods could only aspire to, but I was surprised at some of the notes that he was able to hit during several of the songs that he performed. All in all if your a fan of the Priest, than this is a DVD that you'll want to add to your Metal collection. 5.0 out of 5 starsThe Priest is in fine form here! I was fortunate to have seen this tour back in 2011, and I'm even happier that it made it onto DVD and Blu-ray. Too bad a CD wasn't released because Judas Priest was in outstanding form at this show. Oh, when they came out swinging with "Rapid Fire" the crowd went insane! There's even a beautiful acoustic version of "Diamonds and Rust." I loved it so much that I made my own "Epitaph" CD (but don't tell Rob Halford). A great concert from the Godfathers of Heavy Metal. The band is fine form and Rob Halford's voice has held up incredibly well. Richie Faulkner fits in well and Tipton has not lost anything. I deducted a star because the frenetic over produced nature of the product. The excessive smash cutting is distracting. Maybe the director got paid on a "per edit" basis because there is no excuse for this type of high school editing. 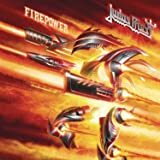 There will never ever be a band like JUDAS PRIEST EVER! !